POSTED: Tue, 02/21/2017 - 20:00 | POSTED BY: Traci C.
What are the impacts of the refurb at Caribbean Beach Resort? According to several guests on the unofficial Caribbean Beach Resort Facebook page, guests with stays beginning in May are receiving emails from Disney informing them that Shutters (the table service restaurant), the Old Port Royale Food Court, and the Banana Cabana Pool Bar will all be closed during construction. Reportedly, Old Port Royale and Shutters will close on April 27. The Calypso Trading Post is also slated to be closed according to the email. Disney is telling guests (again, via the email) that breakfast and dinner will be available in Centertown, and grab-and-go items will be available for purchase at "island markets" located in the villages of Aruba, Martinique, and Jamaica at the resort. Update: As of February 25, several guests are reporting that they're receiving an email from Disney indicating that breakfast and dinner will be served in Centertown, grab-and-go options will be available in three island markets, and refillable mugs can be refilled at Freestyle Coke machines located throughout the resort. A new quick service walk-up window will open this summer in Trinidad. And, both the Martinique and Barbados areas of the resort will close as part of the construction project (which is slated to last two years). We're also seeing reports that Disney is offering guests a $25 Disney Gift card per room, per night of your stay if you are affected by this project. 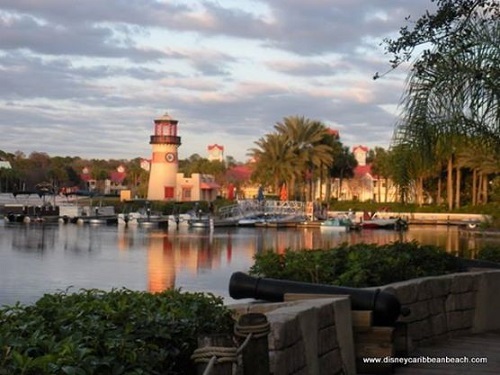 Have you received an email regarding your stay at Caribbean Beach Resort? Or do you have plans to stay there later this year? Let us know in the comments. The email I received said that breakfast and dinner would be available at Centertown (rather than breakfast and lunch) with the grab and go available at the different island markets. I wish we would have known this sooner because we probably would have picked a different resort for this stay since we are bringing first timers with us!